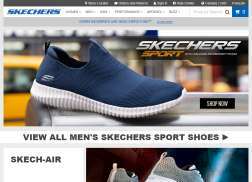 Skechers is an athletic and formal shoe retailer brand. Some of the popular designs available at Skechers include boots, formal, shape-ups, work-ups, sneakers, and sandals. Customers like the hassle free online shopping options on its website as well as the availability of discounts. Wild Wednesday! Save 20% on orders $50+. Wednesdays only. Get 30% Off Skechers Footwear, Apparel And Accessories. Friends and Family Days! Get 30% Off SKECHERS Shoes for the entire family. Apparel is also included and you can purchase up to 10 Pairs! Get 20% Off Any Skechers Kids shoes. Valid on Tuesdays only. Get 30% off SKECHERS Footwear, Apparel and accessories. Good for up to 10 pairs! Join Skechers Elite for Free & Earn 100 Points + Get a $10 Rewards Certificate for Signing Up. Members earn 1 point for every dollar spent & $10 certificate for every 100 points + Free Ground Shipping & Returns + Exclusive member only promotions. Get Select Shoe Styles for Girls under $50. Get Free Shipping & Returns on All orders! Limited time offer. Join SKECHERS Elite Loyalty Program.